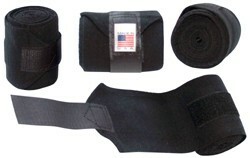 Black Stall Bandage/Cold Water Bandage 4 inch wide x 9 ft. long w/extra wide Velcro. Classic OLD TIME top quality. Perfect stall bandage over Vac's No Bow Wraps. This COTTON knit absorbs perfectly to also be a great COLD WATER bandage. Vac's exclusive new "NO CHEW" Velcro placement helps prevent the bandage from being chewed off. 4 Rolls per pkg. Black Stall Bandage/Cold Water Bandage 4 inch wide x 9 ft. long w/extra wide Velcro. Classic OLD TIME top quality. Perfect stall bandage over Vac's No Bow Wraps. This COTTON knit absorbs perfectly to also be a great COLD WATER bandage. Vac's exclusive new "NO CHEW" Velcro placement helps prevent the bandage from being chewed off.